First Line: All the training, all the waiting, all the unvoiced speculation: what it might feel like, how you might cope. In this fourth book in this police procedural series set in Portsmouth, England, Joe Faraday has recently been promoted to the elite Major Crimes team. Not only has he been promoted, he's been tossed in at the deep end. Prison guard Paul Coughlin has been murdered, and Faraday learns that the suspect list is a long one. The only ones putting in a good word for Coughlin are his superiors at the prison. The suspect list lengthens further when it is discovered that Coughlin was an ex-petty officer in the Royal Navy who served aboard the HMS Accolade which was sunk during the Falklands war. Yes, it's one of those cases that calls for sheer persistence and determined fact finding-- but will Faraday's superior in Major Crimes have the necessary patience? This is one of my favorite British police procedural series. Faraday is a determined investigator who demands truth and justice. As a widower, he hasn't had an easy time of raising his deaf son by himself, but he's done a good job-- even though both his job and his son have had him hiking out to commune with the birds he loves so much. (Some detectives hit the bottle, others listen to jazz or opera, Faraday goes bird watching.) Joe's son is pretty much independent at this stage and even helps during the investigation. I've enjoyed watching him grow up during this series. As usual, the Portsmouth setting is superb from its wildlife habitats to the mean city streets. 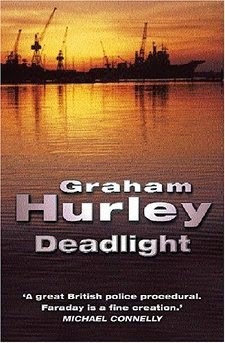 Hurley seems to be a writer that's not all that well known outside of the UK. It's a pity because his books are excellent, but that lack of "world renown" also makes me feel as though I'm getting an insider's look at his patch of England. His books aren't polished up or toned down for international audiences. It's an insider's look that I appreciate and keep coming back to for more.